This is the warning that greats you at the start of the path. 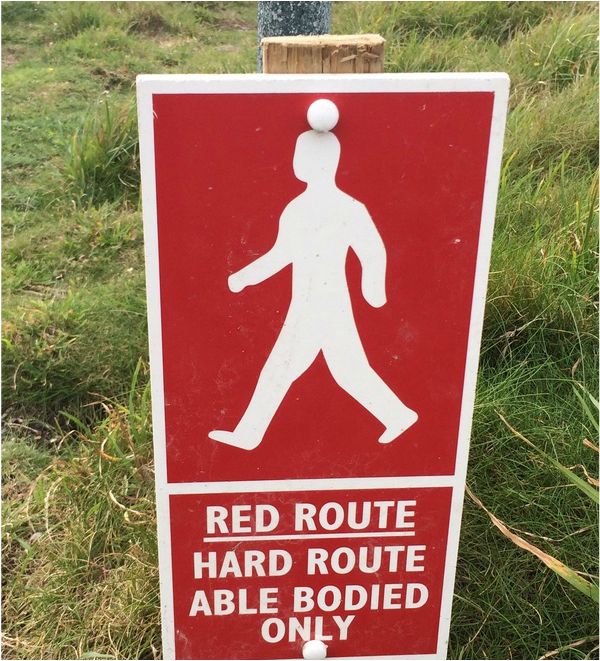 I'm pretty sure able-bodied needs a hyphen. Also, what's with the left arm and leg of the guy being decidedly bigger than the right; did someone decide that as the left side is closer to us, it should be bigger? So they care about perspective but not grammar? I don't understand sign makers. We finish the walk at Porthcurno, famous for this theatre built in the cliffs back in the early 30s and added on to ever since. The Minack was the brainchild of this woman. Rowena and her gardener Billy Rawlings carted granite boulders and wheelbarrowed earth to create the lower terraces of the theatre. Most of the theatre is made of concrete, mixed up on site with the tons of sand that Rowena and Billy (and later others) hauled up from the beach. You can see live webcam videos here. Check out the roaring sea! Read more and see more photos here. By the time we finish the hike it's turned into a cold, rainy, blustery day and we care much more about food and drink than history on the cliffs. Bob gets tea and sausage roll. Susanne and I eat a pastie each. ​and end here as well. Maybe at this very same table.